When it comes to cars, I do love the weird stuff. I mean, there are a tonne of loveable losers on the Out of Box Reviews page; everything from Pintos and Kei Cars to Chevettes and Volares. However, there are many more weird car kits out there than that. Some of them, in fact, aren’t really “cars” at all. At least not as we think of them. In many parts of the world, recovery after the Second World War was a slow, often painful, rebuilding. As both sides in the conflict began to adjust to the new post-war world, the need for cheap, reliable and rugged transportation became paramount. As it always has been since the introduction of the Model T, (and much to the chagrin of bicycle-riding granola-types everywhere), automobiles and the industries that produce and support them were the lynchpins of this new world order. In order to drive progress, industry had to be re-established, and people needed a way to get themselves, and their goods, to where they were needed. This resulted, both in Europe and Asia especially, in a new breed of tough, simple car. The VW Beetle and Citroen 2CV were typical vehicles of the era. However, there were even smaller cars, like Isettas and Messerschmitts, designed to move people quickly, and cheaply, through the increasingly dense cities of their home countries. In some countries, the “three-wheeler” found quite a niche market. Vehicles with three wheels were taxed at far lower rates, and were more nimble in crowded city environments. Of course, even the Isetta started out as such a beast! Nowhere, though, was the three-wheeler adopted more zealously than in Japan. However, many Japanese three-wheelers weren’t for personal transport; they were for commercial use! Light delivery services made excellent uses of the available models, and as time progressed, the three-wheelers became both more refined, as well as more capable. In fact, there are a couple of three-wheelers that are actually monsters of their breeds! These “heavies” can carry upwards of a tonne and a half; no mean feat for a tricycle! Given their oddness, especially to North American eyes and tastes, I, of course, LOVE three-wheelers. I have always wanted to have at least one in my stash and on display, just so people see it and go “What IS that?” if nothing else. Thankfully, the good folks at LS (and later Arii) have me covered! They have a series of kits called the “Owner’s Club” collection, which are simple 1/32 scale replicas of classic Japanese cars from the 1950’s forwards. For those who didn’t grow up where these cars were available in real life, this series offers a wealth of interesting and almost unknown subjects. It goes without saying, too, that the series includes some venerable three-wheelers! Imagine my surprise and delight when, for Christmas, I received a beautiful gift bag containing not one, but FIVE of these interesting and none-too-common kits. Now, imagine how excited I was to find out they were ALL three-wheelers!!! Here’s something you don’t see everyday! 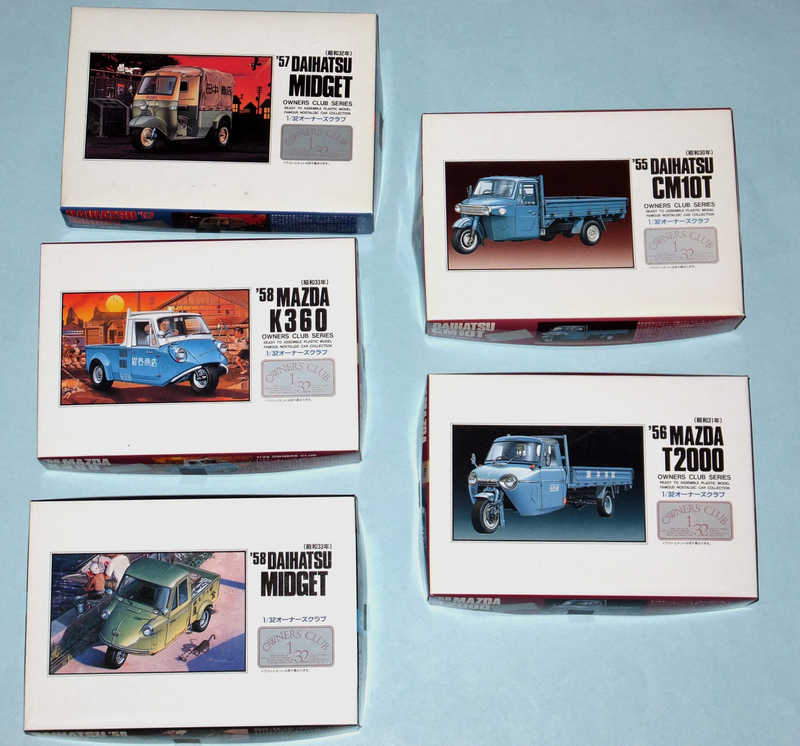 This is my collection of 1/32 three-wheelers; note the difference in box art styel between the “Lights” and “Heavies”. These little guys all come in similarly-styled boxes, a white lid with a painting of the vehicle on it. This is typical of most, if not all, the “Owner’s Club” kits. The one side of the box has the art repeated with Japanese text, and there’s some English on the other side, although I get the feeling it’s not quite a direct translation, since many of them don’t tell you anything about the vehicle itself! 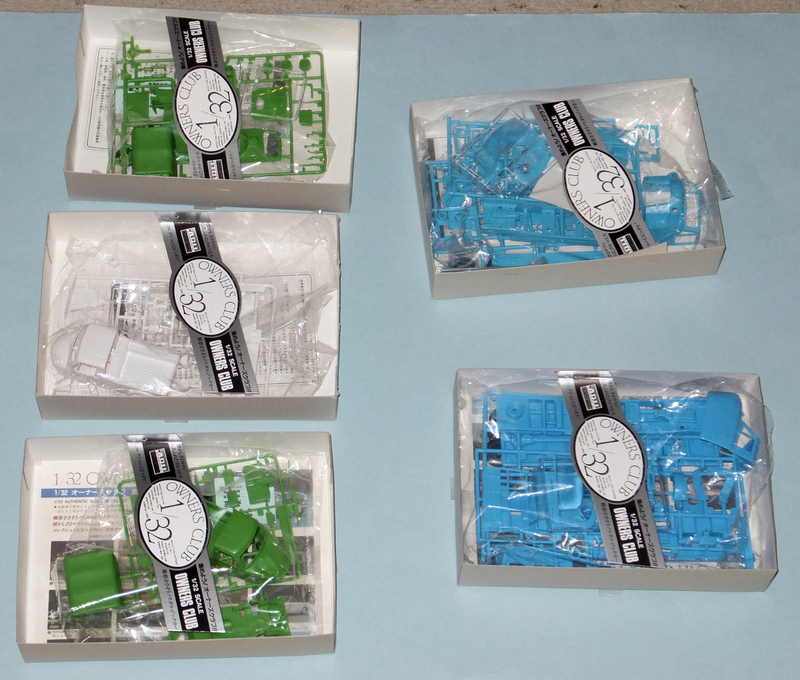 To that end, the kits come on a couple of sprues with separate glass and tires. Oddly, there always seem to be four tires; one might be for a spare on the vehicle, or it might be a legitimate spare for you! I’m not sure what it says, but I’m pretty sure the English on the other side isn’t a direct translation. It would be nice if it was, since I’d like to know more about these things. Google is my friend, it seems! Because they’re 1/32, the smaller kits are very small. They’re simple, cute and have just the right amount of detail. By this, I mean they reproduce the Spartan trappings and trim of the real vehicles excellently. The bigger vehicles, though, are much more involved, with cargo beds you need to build up from parts and large frames separate from the rest of the vehicles. They give the impression of being very strong and of a totally different class than the smaller kits, both in kit form and in real life. This is what’s inside the boxes. They’re cute, colourful and weird… just what you need to break up a case of AMS or the winter blahs. None of the kits are particularly difficult looking, and they should build up into some very interesting and eye-catching models. I hope to have one done soon, just so I can start seeing people’s reactions at model shows! If you like the weird stuff, want something different or just need something odd and silly to snap you out of a funk, these guys are just what the doctor ordered, literally!